i remember one time, i did this one thing, in this one place, and it was kind of good. Te question really lies in how old those wings were BEFORE they came into your home. A week? I'd do it. Did I mention I get mild food poisoning frequently? The trots just help you lose the weight you would have gained by eating sad wings. Do it. It will be delicious. Eeeewwwwwwww. Most recent found-dinner included 1/2 cup of pasta, wilted veggies (asparagus, onion, mushrooms, tomatoes and broccoli) a can of sweet peas from god-knows-when, some sliced ham lunch meat, liquid aminos, packets of soy sauce from a drawer, hot mustard also from a drawer, and some margerine dredges. Quasi stir fry. It was ok. Would have been better if I had any peanut butter. And pineapple. And not-ham. But hey. I'm fed now. Barry! Welcome to the group! holy crap that experience with the sub is insane. reminds me of the htmlgiant back and forth you had earlier this year with some editors about response times. damn, sometimes, it's unsettling to be up at 3 a.m. writing stories to sub places like that. Whooooa. Seriously? If you're serious, I mean: WHOA. I have approximately 27 overly-personal questions I wanna ask you. Riehl? Nice and German. Are you a fellow fallen Menno? favorite writers don't have to be on lists to be favorites. would you please write something not weird on my wall sometime? and it would be cool if it wasn't "something not weird." Thanks for reading and commenting on "Cracking Open." I appreciate it, and don't know where you find the time for it all. We writers are so glad that you do. Hi Barry, thanks for the compliments on my story. thanks for commenting on my story. 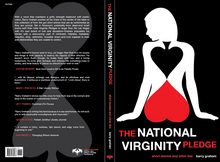 i want to read National Virginity Pledge soon. i would say more but i don't know what and i just said a thing about Dickey Dew. thanks again, and hello. Thanks for your kind words awhile back. Your book looks amazing. Thanks Barry. Right back at you. I dug the collages and Another Sky said they shipped TNVP, so I can't wait for that. Barry, I wouldn't be on this list if not for you. Thank you. Thanks. Is that your book, or a book you love in your picture? Thanks so much- you were my first Fictionaut reader ever! Hey, thanks for your comments on my story! Hey, Barry! Yes, I'm everywhere lately, it seems. :) Nice to see you here. thanks man. dude, you’re a beast! just got story taken in decomP! i'm ready for UFC now and the rest of jersey. thanks for the invite. I'd like to add you as a contact - but I don't know how. Newness - such an obstacle course. The Transvestite Marilyn is hilarious - I almost wrote something on that one instead - it begs for a story - you should go for it. I love using pics for prompts. thanks & thanks--is this like fight club? Hello, you're quick - I just signed on today and posted that story, got inspired after viewing some of Cooper Renner's pictures. It is wonderful to meet you- I look forward to reading some of your work as well. Thanks for reading my short. Hope you're doing well. Thanks for the kind remarks on my story a while back! Thank you for the read! I'm pleased you enjoyed it. Thanks for reading my story, Barry! And, hey, where's my CD? You were supposed to be sending me a CD, weren't you? lol. That's my favorite kind of cake! Hey Barry! I never saw Back to School. I think it's cool Vonnegut was in it, though. That American Express commercial, not so much. That kind of pissed me off. How's tricks? What are you eating in that pic? I keep thinking a mouthful of nachos, but that's only because I just read Lovelace's story. You must log in to write on barry graham's wall.